For his son, the baseball executive, see Joe Garagiola Jr.
Joseph Henry "Joe" Garagiola Sr. (February 12, 1926 – March 23, 2016) was an American professional baseball catcher, later an announcer and television host, popular for his colorful personality. 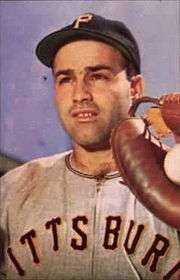 Garagiola played nine seasons in Major League Baseball (MLB) for the St. Louis Cardinals, Pittsburgh Pirates, Chicago Cubs, and the New York Giants. He was also well known outside of baseball for having been one of the regular panelists on The Today Show for many years, and for his numerous appearances on game shows, both as a host and panelist. Garagiola was born in St. Louis, Missouri. He grew up on Elizabeth Avenue in an Italian-American neighborhood in St. Louis known as The Hill, just across the street from his childhood friend and competitor, Yogi Berra. (That block was subsequently renamed "Hall of Fame Place".) When Berra and Garagiola were both teenagers, almost all pro scouts rated Garagiola as the better baseball prospect, although Berra had a Hall of Fame career, and Garagiola always respected Berra's ability. About growing up living next to Berra, Garagiola once said, "Not only was I not the best catcher in the Major Leagues, I wasn't even the best catcher on my street!" Garagiola was signed at age 16 by the St. Louis Cardinals organization. At age 17, he remains the youngest player to play in Columbus Red Birds history. Garagiola advanced to Columbus of the Class AA American Association in 1943, and was with them when he was called into military service on April 24, 1944. 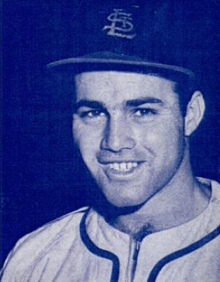 After taking basic training at Jefferson Barracks, Missouri, Garagiola was sent to Fort Riley, Kansas, where he quickly established himself as the catcher for the Fort Riley Centaurs, with teammates Rex Barney and Pete Reiser. Garagiola was sent to the Philippines in 1945, where he played ball for Kirby Higbe’s Manila Dodgers. He was discharged from service in early 1946, and he was just 20 years old when he joined the Cardinals. Garagiola made his major league debut in 1946. As a rookie in 1946, in his only World Series appearance, Garagiola batted a 6-for-19 in five games, including a Game 4 where he went 4-for-5 with 3 RBIs. By contrast, Ted Williams went only 5-for-25 in the same series, which was also Williams' only World Series appearance. On September 11, 1947, Joe Garagiola and Jackie Robinson were involved in an incident at home plate. Garagiola allegedly stepped on Robinson's foot and the two argued. Umpire Beans Reardon held back Garagiola while Robinson clapped. The incident was later part of a children's book titled In the Year of the Boar and Jackie Robinson. Garagiola never quite lived up to the promise of his youth, appearing in only 676 games over 9 seasons for St. Louis, the Pittsburgh Pirates, Chicago Cubs, and New York Giants. He was a mediocre (though certainly good for a catcher) hitter in the majors, which featured in his self-deprecating humor. He once told this story himself: "He knew that it was time to retire when he was catching, and his ex-teammate Stan Musial stepped into the batter's box, turned to Joe, and said, "When are you gonna quit?"" Looking back at his career in 1970, Garagiola observed, "It's not a record, but being traded four times when there are only eight teams in the league tells you something. I thought I was modeling uniforms for the National League." After his retirement from baseball, Garagiola lent his name to a 1960 book, Baseball is a Funny Game, which sold well upon release and helped establish Garagiola as a "personality." The book—largely ghostwritten—was a collection of humorous anecdotes surrounding his upbringing and his playing career, and showcased the folksy, humorous style that became his trademark as a broadcaster. Garagiola was also the author of It's Anybody's Ballgame (1980) and Just Play Ball (2007). Garagiola turned to broadcasting following his retirement as a player, first calling Cardinals radio broadcasts on KMOX from 1955 to 1962. As an announcer, Garagiola was best known for his almost 30-year association with NBC television. He began doing national baseball broadcasts for the network in 1961 (teaming with Bob Wolff). Additionally, Garagiola called several World Series on NBC Radio in the 1960s, teaming with a number of announcers including By Saam and George Kell. After a stint doing New York Yankees games from 1965 to 1967, that saw him call Mickey Mantle's 500th home run, Garagiola returned to broadcasting NBC baseball, initially as the host of the pre-game show, The Baseball World of Joe Garagiola, and then as a play-by-play announcer beginning in 1974. Garagiola alternated play-by-play duties with Curt Gowdy on NBC until 1976, when he assumed the role full-time. He teamed with color commentator Tony Kubek from 1976 to 1982; in 1983, he shifted to color commentary as Vin Scully joined the network as lead play-by-play announcer. (Kubek joined Bob Costas to form NBC's #2 baseball announcing duo in this era.) Besides working on the Saturday Game of the Week for NBC, the team of Scully and Garagiola would call three All-Star Games (1983, 1985, and 1987), three National League Championship Series (1983, 1985, and 1987), and three World Series (1984, 1986, and 1988). After calling the 1988 World Series with Scully, Garagiola resigned from NBC Sports. NBC was on the verge of losing the television rights to cover Major League Baseball to CBS, and Garagiola claimed that the network left him "twisting" while he was trying to renegotiate his deal. Garagiola was replaced on the NBC telecasts by Tom Seaver. After leaving NBC Sports, Garagiola spent one season (1990) as a cable-television commentator for the California Angels. From 1998 to 2012, he performed part-time color commentary duties for the Arizona Diamondbacks, where his son, Joe Garagiola Jr., served as general manager. Garagiola officially announced his retirement from broadcasting on February 22, 2013. Besides calling baseball games for NBC, Garagiola served as a panelist on The Today Show from 1967 to 1973 and again from 1990 to 1992. He also occasionally guest-hosted The Tonight Show Starring Johnny Carson, including the only live appearances of any members of The Beatles on the program while still a group (John Lennon and Paul McCartney were the guests in May 1968). In the late 1960s and 1970s, Garagiola also hosted the game shows He Said, She Said; Joe Garagiola's Memory Game; Sale of the Century; and To Tell the Truth, as well as a short-lived '80s game, Strike It Rich. Garagiola was also a guest celebrity panelist on Match Game in the late 1970s. He also hosted the St. Louis area professional wrestling show, titled Wrestling at the Chase, and was a regular host of the Orange Bowl Parade in Miami on New Year's Eve. Garagiola later gained a new form of fame as co-host of the Westminster Kennel Club Dog Show for USA Network from 1994 to 2002. From 1969 to 1970, Garagiola was the Saturday afternoon host of the NBC Radio Network program Monitor. (A link to a sample of his hosting is found below.) During the 1960s, he also contributed commentaries to Monitor for several years and had a daily five-minute morning drivetime sports commentary program on the network. In 1970, Garagiola appeared at a preliminary trial following former Cardinals outfielder Curt Flood's lawsuit against Major League Baseball, challenging the game's reserve clause. Testifying before Judge Irving Ben Cooper in New York, Garagiola defended the clause, a stance he later deemed a "terrible mistake". Joe Garagiola (left) watching the 1976 election returns with US President Gerald Ford (right), an election for which they'd done a series of television ads together. In the 1976 US presidential election, Garagiola enthusiastically supported the candidacy of President Gerald Ford. During the fall campaign, the Republican National Committee hired Garagiola to do a series of television ads with Ford; the ads consisted of Garagiola talking to Ford in a relaxed, informal setting. Derided by Ford's critics as "The Joe and Jerry Show", the ads in their opinion were considered to have negatively affected the Ford campaign. The two men became close friends. On election night in November 1976, Ford invited Garagiola to be one of his guests at the White House to watch the results on television. Ford lost the election to Jimmy Carter. Garagiola was an advocate against the use of chewing tobacco. He had picked up the habit during his playing days with the Cardinals, but quit cold turkey in the late-1950s. He annually visited major league teams during spring training, alongside players from his generation who have suffered from oral cancer related to the addiction. Garagiola was the keynote luncheon speaker at the 2007 convention of the Society for American Baseball Research held in St. Louis. On December 4, 2013, Garagiola was named as the 2014 recipient of the Buck O'Neil Lifetime Achievement Award, presented once every three years by the Baseball Hall of Fame for positive contributions to Major League Baseball. The Hall's official announcement specifically cited his advocacy against smokeless tobacco, as well as his role as a founder of the Baseball Assistance Team, a charity that provides grants to needy members of the professional baseball community. Joe Garagiola Sr married Audrie Rose in 1949. Two of the couple's sons would later have an association with the game of baseball. As noted above, Garagiola's son, Joe Jr., went on to become the general manager for the Arizona Diamondbacks, and later senior vice president of baseball operations for Major League Baseball. His other son, Steve, is a broadcast journalist as well, serving as a reporter and anchor for WDIV-TV, the NBC affiliate in Detroit. His daughter, Gina, has also worked in TV news, as a field reporter for Arizona station KTVK, and is now a freelance writer. Garagiola Sr. had eight grandchildren. Garagiola died on March 23, 2016, at the age of 90. The Diamondbacks will wear a patch in his memory on their right sleeve for the 2016 season, a black circle with "JOE" written in white in the center, with a catchers' mask replacing the O.
Garagiola's funeral services were held on April 13, at St. Ambrose Catholic Church, in St. Louis, Missouri, the same church where he was baptized. Upon his death, he was cremated; his ashes were given to his family. ↑ Eig, Jonathan (2007). Opening Day: The Story of Jackie Robinson's First Season. New York: Simon & Schuster. p. 228. ISBN 978-0-7432-9461-4. ↑ "inauthor:"Joe Garagiola" - Google Search". ↑ Stewart, Larry (November 9, 1988). "Garagiola Leaves Job With NBC : Baseball Commentator Upset Network Didn't Begin Negotiations". Los Angeles Times. ↑ Snyder, Brad (2006). A Well-Paid Slave: Curt Flood's Fight for Free Agency in Professional Sports. New York: Viking Press. pp. 180–181, 342. ISBN 0-670-03794-X. ↑ Vecsey, George. "Garagiola, Who Quit, Warns About Chewing Tobacco," The New York Times, Sunday, May 30, 2010. ↑ "Joe Garagiola Named Buck O'Neil Award Winner" (Press release). National Baseball Hall of Fame and Museum. December 4, 2013. Retrieved December 10, 2013. ↑ "Legendary baseball announcer Joe Garagiola Sr. dies at age 90". ESPN.com. March 23, 2016. Retrieved March 23, 2016. ↑ "Joe Garagiola Eulogized In The Same Church, Where He Was Baptized". Fox2now.com. 2016-04-14. Retrieved April 19, 2016. ↑ "Former Cardinal Joe Garagiola Is Laid To Rest". BizJournals.com. 2016-04-14. Retrieved April 19, 2016.